David “KP” Bryce Kirkpatrick was a pillar. He was a pillar of his faith, a pillar of his family and a pillar in his education career. On Monday, March 16, David died after a courageous four-year battle with cancer. This week his former students and colleagues remember his deep and abiding influence on their work and lives. A common theme among all his friends and colleagues were the “KP hug,” his always- positive attitude and his ever-present warm smile. Lapeer East teacher and girls’ soccer coach Bill Kinzer knew “KP” as a student and later as a colleague. West teacher Andy Roberts also remembered KP’s connection with the students, including those that might have had discipline issues or outside school problems. When his mother died, Roberts’ younger sister was a senior, and a former player of Kirkpatrick’s. Although she was worried about her grades, she was not ready to go back to school and it was Kirkpatrick who told her to deal with her grief and that he would take care of getting her caught back up in school. 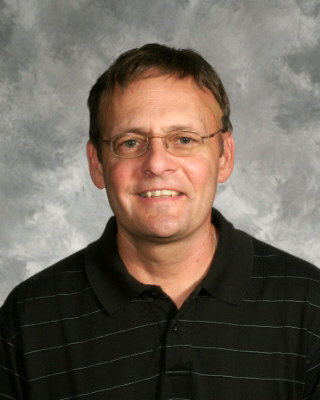 Even with his great affection for his students, his life’s priorities were firm, said West counselor Brad Walker. At work he was diligent and focused on making a positive change for students. “I’ll always remember sitting in the back room discussing how to better serve the students of Lapeer Schools, especially the ones who seemed to have no desire to be reached,” Walker said. Everyone remembered KP’s devotion to his career. East teacher and soccer coach Chad Kenny remembered KP as a person who just made everyone around them better. West counselor Karol Settergren remembered KP as her mentor and friend during her 11-year counseling career in the District. Lapeer Superintendent Debbie Thompson’s memories of David were in his capacity as counselor at a time when she was in charge of curriculum and instruction. A 1970 graduate of Southfield High School, Kirkpatrick attended Rochester College where he played basketball. He received his bachelor’s degree from Oakland University and began his teaching career at Lapeer Community Schools. In addition to his teaching and counseling career, he was a track, soccer, basketball and Quiz Bowl coach. He earned a master’s degree in administration at Central Michigan University and was a licensed, professional counselor. He spent the last portion of his nearly 32-year career as a guidance counselor at E.T. White Junior High School and Lapeer West High School. In 1995, he was awarded a “Distinguished Service Award” by the Great Teachers Foundation. In 2005, he received the Outstanding Alumnus in Education Award from Rochester College. He served as an elder at the Lake Orion Church of Christ and was most recently a member of the Lapeer Church of Christ. He also served on the Michigan Christian Youth Camp Board of Directors and was chairman of the Board of Trustees for the Metropolitan Detroit Youth Chorus. KP is survived by his wife of 36 years, Niki; his daughter, Sara (Kevin) Nelms, of Metamora; son-in-law, Nick Godwin, of Port Huron; grandchildren, Jake David and Hayley-Kate Elizabeth Nelms, of Metamora; parents, James and Hazel Kirkpatrick, of Southfield; a brother, Thomas Kirkpatrick, of Lake Orion; parents-in-law, Nick and Geneva Schafsnitz, of Arizona; sister-in-law, Dawn (Jack) Neveau, of Arizona; nephew, Jonathan Neveau, of Arizona; niece, April (Tom) Martini, of Arizona; great nieces, Kaitlyn, Jacklyn and Madilyn Martini, of Arizona; and countless other family, friends and colleagues. He was preceded in death by an infant son, Nathan Kirkpatrick, in 1982, and daughter, Katie Elizabeth Kirkpatrick Godwin, who died in January 2005 after her courageous battle with cancer. Memorial contributions are requested to Katie’s Wings, P.O. Box 458, Metamora, Michigan, 48455. Katie’s Wings is a non-profit organization founded by the Kirpatrick family in memory of their daughter, Katie. It provides assistance to local people dealing with cancer by offering products and services through Katie’s Spa in Lapeer. Visitation is tonight (Friday), March 20 from 2-8 p.m. at the Lapeer Church of Christ, 1680 N. Lapeer Road. Funeral services are planned for 11 a.m. Saturday, March 21, at the Bristol Road Church of Christ, 1315 W. Bristol Road in Flint.